The friendliness and helpfulness of Yiota. The plants all around our little verandah. The proximity of the village shops, harbour ,restaurants and church square. The swimming platform from the rocks ( called Gnospi ), nearby and the hire bikes to cycle the coast path into Stoupa. Flower pots and plants everywhere makes it cozy and pretty. The lady who owns the place is informative and very friendly. Her english is very good. L'accueil est agréable. La propriétaire est très disponible et donne des bonnes renseignements sur le lieu. L'appartement est correct. מקום מקסים, בעלת הבית נחמדה ביותר, מוקף צמחיה, מרחק הליכה קצרה מחוף נעים. הדירה מרווחת, מאובזרת היטב, נקייה ביותר, נוחה, שקטה, יש פרטיות למרות שישנן עוד דירות צמודות, מרחק קצרצר ממיני מרקט וטברנות, בקיצור ממש מומלץ! Отличные апартаменты, прекрасное местоположение: 3 мин до центра деревеньки с магазинами и кафе, 3 мин до милого уединенного пляжа в скалах среди пещер (пляж для детей не годится, сразу глубоко, но для взрослых - отличный, можно даже нырять со специальной площадки). Уютно, чисто, очень много зелени во дворике, очень тихо. Дружелюбная хозяйка все объяснила, показала дорогу на пляж. Есть своя парковка - это важно в греческих тесных деревнях. Le calme et la proximité du charmant petit port d'Agios. Lock in a great price for Skafidakia – rated 9.2 by recent guests! 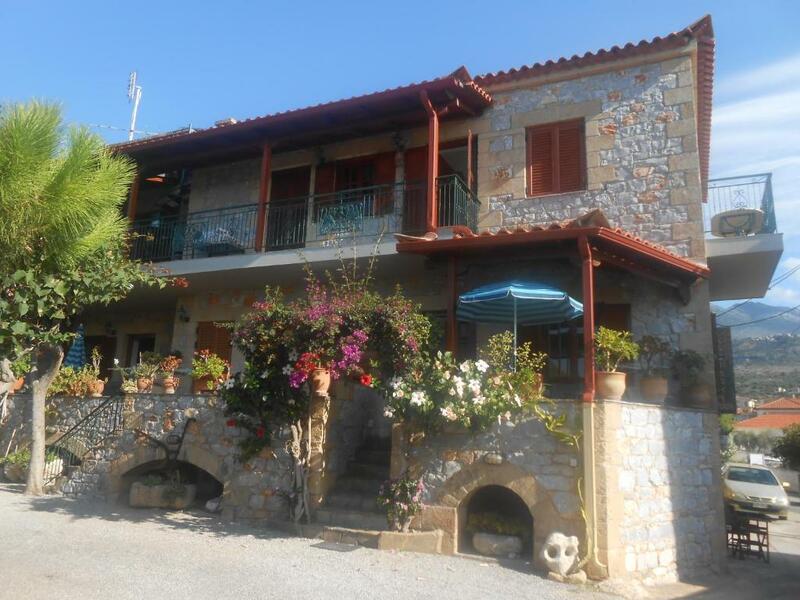 Skafidakia is a traditional, stone property located 350 feet from the center of Agios Nikolaos Village. It offers sellf-catering units and free WiFi throughout. Gnospi Beach is 650 feet away. Opening to a terrace with garden views, all air-conditioned apartments at Skafidakia feature a kitchenette with cooking hobs and refrigerator. A flat-screen TV and a safety deposit box come standard. Kalamata Airport is at a distance of 22 mi. Free private parking is possible nearby. When would you like to stay at Skafidakia? Opening to a terrace with garden views, this air-conditioned apartment features a kitchenette with cooking hobs and refrigerator. A flat-screen TV and a safety deposit box come standard. Free WiFi is available. House Rules Skafidakia takes special requests – add in the next step! Location layout beach close by. Some of the rooms in our apartment were somewhat on the small side. I am quite tall and found the bathroom a tight fit.